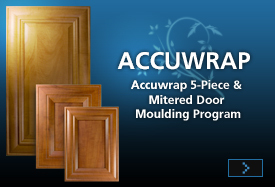 AccuWrap Door Jambs are made with only the best materials available to meet the high quality standards, demanded by a discerning industry. Our exterior grade Vinyl will not fade, chalk or deteriorate if left untreated. Paintable and stainable, our wrapped jambs will resist cracking, wicking and insect damage, adding value and assurance to your finished door system. Headers, brick moulding and other exterior grade architectural products are also available in the same paintable exterior Vinyl. Both stock and custom programs are available to service every size customer both large and small, to assure customer satisfaction.